The NYC Fire Museum has been telling the story of the FDNY since 1934, having had a number of homes before taking up its current residence—at a former firehouse that served as Engine Company No. 30’s headquarters—in 1987. Now, the museum contains a vast collection of historic firefighting memorabilia dating all the way back to the 1600s, with highlights including vintage FDNY uniforms, ornate hand pumpers, a horse-drawn ladder wagon, and a 1921 American La France engine. The museum is also home to the city’s first permanent memorial to the 343 FDNY members who died in the attacks on September 11, 2001, featuring photographs of the fallen firefighters, tributes, tools used, and items recovered in Ground Zero. Admission is $8 for adults, $5 for students, seniors, and children over two. For folks interested in learning more about the United States’ storied history of organized crime, the Museum of the American Gangster digs into the American mob’s roots, offering up a wide collection of memorabilia. Visitors to the museum get a $20 guided tour, with highlights including bullets from the Saint Valentine’s Day Massacre, John Dillinger’s death masks, vintage automatic shotguns, and vivid, detailed stories about famed mobsters like John Gotti and Al Capone. As a bonus, the museum itself is housed in an old speakeasy that was once frequented by the likes of Gotti, Capone, and Lucky Luciano, and you can still buy moonshine and other temperance-era drinks at the bar. Budding mathematicians love the National Museum of Mathematics, or MoMath, a seven-year-old ode to math located right by Madison Square Park. MoMath was specifically launched to “enhance public understanding and perception of mathematics,” and provides visitors with hands-on exhibitions focusings on concepts like pi, kinetics, shapes, hyperboloids, fractals, and parabolas. Popular offerings include a square-wheeled trike, which allows visitors to smoothly navigate round tubes atop square wheels; Hoop Curves!, in which visitors can use throw statistics to help a robotic basketball shooter get a ball throw a hoop; and the Twisted Thruway, where you can take a virtual ride on a Möbius strip. Admission is $17 for adults, $14 for seniors, students, and children over two. Shortened to MoRUS, the Museum of Reclaimed Urban Space explores the history of grassroots urban space activism, namely that of the East Village. Located in a former squat in Alphabet City, the museum “celebrates the local activists who transformed abandoned spaces and vacant lots into vibrant community spaces and gardens,” and how that has affected change throughout the years in NYC. 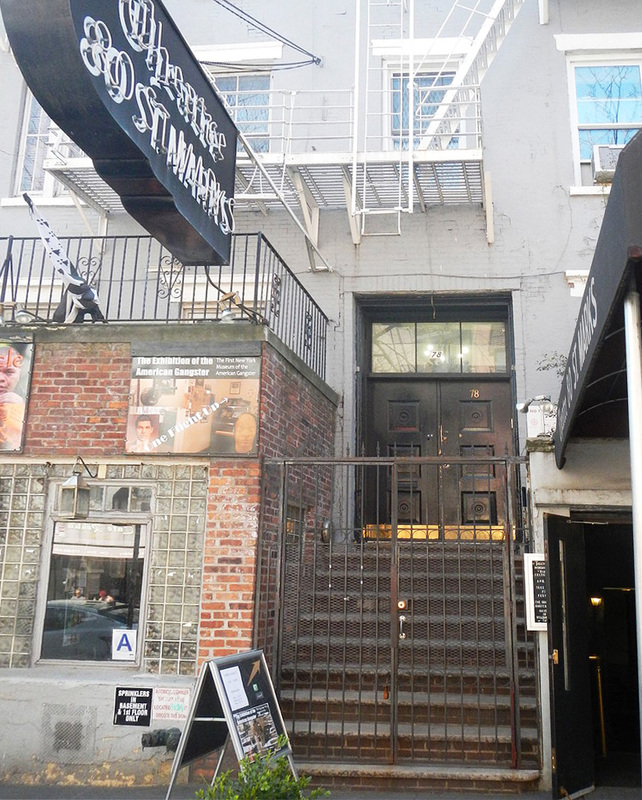 In addition to permanent exhibits about the history of squats, MoRUS has special offerings, such as the current “Politics of Punk: Radical Action in Radical Times” exhibit, as well as guided tours of the East Village and Lower East Side and workshops and workdays in the neighborhood’s 39 community gardens. There’s a $5 suggested donation. 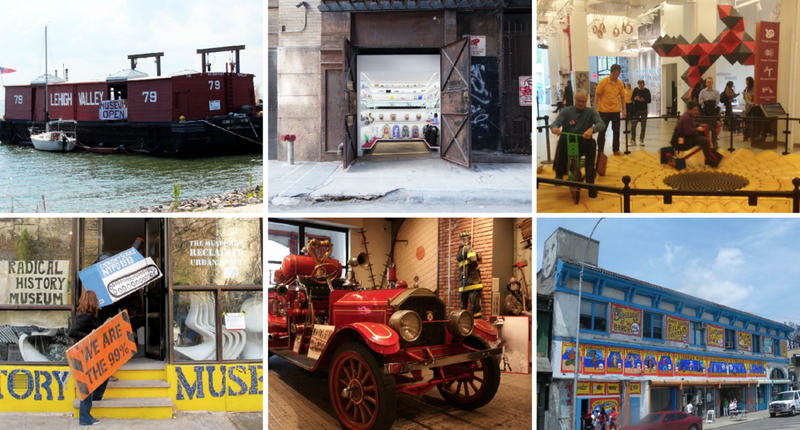 Coney Island itself feels like an archived testament to old New York, but the Coney Island Museum takes vintage a step further, highlighting the famed amusement park’s quirky history for only $5. The museum’s small space holds a wealth of treasures, including antique Fun House mirrors, vintage Side Show posters, and old-school paraphernalia, plus you can watch lots of videos of old Coney Island, which is always fun. Other highlights include the museum’s weekly magic shows on Sundays at noon, and the Freak Bar, which sells drinks and fun gifts downstairs. The City Reliquary is one of the city’s finest offbeat treasures, boasting an incredible collection of local memorabilia and oddities, and though it’s quirky and cluttered, that’s part of its charm. The not-for-profit community museum has everything from founder Dave Herman’s collection of Statue of Liberty figures to the bones of a subway rat to Anthora coffee cups, making it a fun spot to visit for locals and tourists alike. They’ve also got tons of found objects, like old nails and seltzer bottles, as well as true pieces of New York history, like the original 2nd Avenue Deli sign and Brooklyn Dodgers merchandise. There’s also a lovely backyard, where the museum hosts events in good weather. Admission is $7 for adults, $5 for seniors, students, and educators. Children are free. If you enjoy riding the Holiday Nostalgia Train every year around Christmas, you’ll love the NY Transit Museum’s collection of vintage subway cars, which sit inside a real (though decommissioned) subway station in Downtown Brooklyn. You can walk through cars built in 1903, peruse vintage ads on cars from the 1940s, and sit in leather seats from 1917—the collection is so impressive and so well-preserved, they’re often used for films and television programs (see if you can spot one on “The Marvelous Mrs. Maisel”). The museum also boasts an impressive collection of vintage train tokens; photos of historic trains, trolleys, and buses; and interactive “street furniture,” including a 12-seat bus cab and walk/don’t walk signs you can play with. Admission is $10 for adults, $5 for seniors and children ages two to 12. If we’re awarding medals for most offbeat, the Mmuseumm takes gold. Literally located inside a Chinatown elevator shaft, the 60-square-foot “museum” features a rotating selection of “contemporary artifacts” that adhere to some sort of theme. Past exhibitions have run the gamut from “Modern Religion”—with artifacts like a gluten-free Holy Communion wafers—to Bread Clip Taxonomy, which one can only assume consisted primarily of bread clips. The Mmuseumm is currently closed but will reopen for its seventh (!!) season in the spring. MOFAD, short for the Museum of Food and Drink, is still in the process of creating “the world’s first large-scale food museum.” To get a taste of future MOFAD for now, though, you can visit the museum’s Food Lab in Williamsburg. It’s currently hosting the exhibition Chow, which digs into the history of Chinese American restaurants. Visitors can learn about how Chinese restaurants began and evolved in the United States in the midst of a period of intense anti-Chinese immigrant sentiment, as well as peruse Chinese restaurant menus from all over the country, and enjoy a demonstration and tasting at the exhibition’s conclusion. Tickets are $14 for adults, $10 for students and seniors, and $7 for children. Sitting in the water off a pier in Red Hook is the only wooden railroad barge of its kind still floating. The 1914 Lehigh Valley Barge #79 has been transformed into the Waterfront Barge Museum, founded in 1986 to educate about maritime history as well as advocate for expanded waterfront access. The vessel previously operated in Liberty State Park, Piermont, NY, and the South Street Seaport, but since moving to Brooklyn in 1994, it offers free tours that include the Captain’s original living quarters, tools of longshoremen and stevedores, and gongs and bells from the tug and barge system. They also host a series of “Showboat Performances,” featuring everything from pirate shows to opera to contra dance.